This masculine Men's Copper Hammered Boyfriend Cuff Bracelet is the perfect layering piece. Great to wear with a leather cuff or watch. 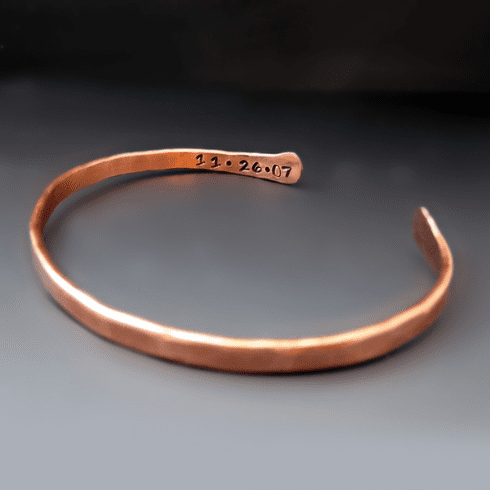 Each end of the cuff can be personalized with up to 12 letters/numbers. Copper is an essential mineral found in plant life and in the human body. Wearing copper jewelry is a long-term folk remedy for arthritis. The copper bracelets can be beneficial for reducing pain and inflammation. This bracelet is custom sized for your wrist and has a 1-1.5 inch opening for sliding off and on. It is slightly adjustable. Measure the circumference of your wrist. ORDER the size that is closest to that measurement. It comes in a variety of lengths and has 1 inch gap for sliding on and off your wrist. I do not coat my jewelry with any lacquer or other chemicals. As this cuff is worn it will develop a masculine patina. It can be polished to a high shine with a silver polishing cloth. After contact with skin, soaps and/or lotions copper can turn green or bluish-green, and stain the skin in the process. The reaction varies according to an individual's body chemistry, The discoloration is not harmful to one's health, and is readily washed off with soap and water. You can clean the bracelet by either washing it with soap and water, wiping it with rubbing alcohol or with a jewelry polishing cloth. 'Penny Bright" is also a great and easy product to clean your copper jewelry and can be found in most grocery stores.